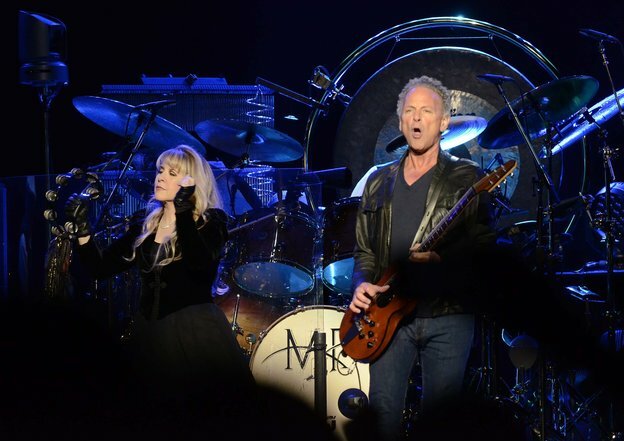 CHARLOTTE — More than 20,000 fans gathered in Charlotte’s Time Warner Arena to pay their respects to the mighty Fleetwood Mac – a band notorious for their love-affairs, drug use, and lethal amount of hits over the past four decades. Although the longevity of the band has never been questioned, it was surprising to see so many 20-something year-olds in the crowd. There were plenty of Stevie Nicks impersonators, of course, draped in their black handkerchief-chiffon dresses and platform boots. Fleetwood Mac is currently on a world tour, which will hit Australia and New Zealand before the year is over. The Australian leg of the tour sold out in a record breaking fifteen minutes, proving that the Mac still has quite the clout. The band opened with a menagerie of hits from their landmark record, “Rumours,” which to this day is the third best-selling album in history with sales nearing 25 million. The first two songs, “Second Hand News” and “The Chain,” kept the crowd on their feet and fists pumping in the air, while the band effortlessly glided through hit after hit. What was the most apparent all throughout the evening was just how hard this band rocks. The night became a bit more somber when Nicks introduced her signature song, “Landslide.” The definitive emotional peak of the evening, “Landslide” talks about growing older and coming to terms with both your mortality and the realization that some “mountains” simply cannot be climbed. After the brief deviation from the more colossal songs, they returned to perform “Gold Dust Woman,” which now feels more like a Broadway number opposed to the gritty original with Nicks acting more like a street urchin than a noble Queen of Rock. Not to be outdone by Nicks, guitar-god Lindsey Buckingham brought down the house with mind-blowing performances of “I’m So Afraid” and the classic “Never Going Back Again,” the latter which had everyone in the house rocking out. While Fleetwood Mac remains an iconic classic rock band, the main draw of the event was undoubtedly Nicks. Thousands still show up to see the now 65-year-old twirl and mythicize her songs into little plays and acts. It was interesting to see just how many young people still look up to her, obviously trying to scratch and claw their way to the front rows to catch an up-close glimpse at the rock queen. The show was amazing, of course. Bassist John McVie and drummer Mick Fleetwood provide one of the most intense rhythm sections in the world. Recently Rolling Stone Magazine took a poll of its readers and asked them who the most recognizable rhythm section was. Fleetwood Mac topped the list. Although McVie, who was once married to ex-keyboardist Christine McVie, and Fleetwood remain largely in the background, their presence is instantly and continually detectable. The show clocked in at two-and-a-half hours, ending at 11 p.m. — quite a feat for an artist in their 20’s, but this is a band whose members are all in the mid to late 60’s. Many fans were talking about the possibility this may be the last Fleetwood Mac tour, but the band showed nothing could be further from the truth. I first saw them in 2004 and again in 2009 and I can honestly say that this tour sees the band in unbelievable synchronicity and much more playful than on any previous tour. Then again, will Fleetwood Mac ever really stop? They’ve been such a huge part of rock music since 1975 that I have a feeling the chain will never really be broken. The band has always been great but as this post says the draw is Stevie,Her voice and image made them superstars something that has in the past atleast gotten under Lindsey's skin or as it seems anyway.Maybe at last they have had a meeting of the minds and he has let the past B/S die.Stevie is also a great solo artist and I for one enjoy her solo albums more. Well, I love the entire band, but I love more the Lindsey vocals and his outrageous guitar playing. He IS No. 1 in my book as the most talented and creative guitar player that ever lived, so my draw is watching more the right side of the stage. He just gets better with age. I still enjoy Stevie and even though she doesn't hit the high notes, it had no change on the sound to me as a whole. She was fantastic. Fleetwood is a Wildman on the drums and puts out a moving sound while John in the background rocks. Everyone, including the fans, ARE older, but Fleetwood Mac play like they could go on for another couple of decades. :-) I'm worn out just standing there watching, but look what they put out night after night. I also enjoy the set list better than EVER. I got to many rock shows but this was hands down the best. I wrote this article. It'll be interesting to see the comments on it! Right on about the draw being Stevie!! I mean could you really imagine drawing crowds without her?? Can you imagine Fleetwood Mac even being if not for her?? Lindsey played my small town last year and I would say most of the crowd kept asking him where Stevie was?? LOLOL at all the Stevie provocateurs in the comments. Although a bit sad. "they returned to perform “Gold Dust Woman,” which now feels more like a Broadway number opposed to the gritty original with Nicks acting more like a street urchin than a noble Queen of Rock." These performances of GDW on this tour will go down in Rock History as some of theirs and Stevie's finest. Gold Dust Woman is one of their most iconic numbers and practically defines Stevie, the 70's, Fleetwood Mac and remains in the collective conscience of an entire generation. On this (which could quite possibly be their last big World Tour) it is very astute of the band to showcase Gold Dust Woman and the nugget "SilverSprings" in the way they have. This is by far their finest tour in decades. If it is their last and no one is saying it is for sure at least they are going out in a big way. Sold Out worldwide and the most compelling performances ~ and at their ages. Who would have ever thought in a million years they could pull it off!! Rock On Gold Dust Woman.